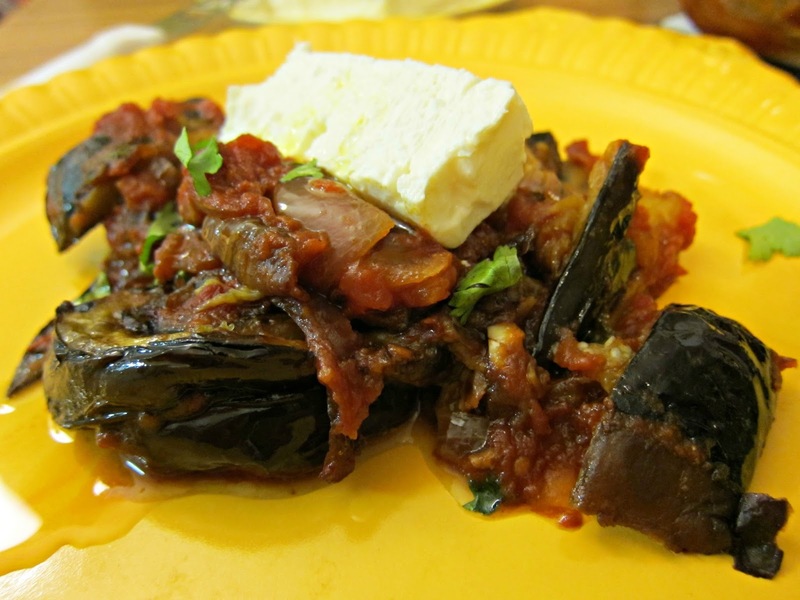 The imam baildi I know and love involves my Aunt Mary's kitchen in Athens, a huge pot, a barrel of fresh olive oil stored underneath the sink, and the obvious (eggplants, onions, garlic and canned tomatoes). It's my Aunt Mary at 7 in the morning with awesomely frazzled hair, dressed in a silky bathrobe throwing these ingredients in a pot and cooking it low and slow for the next 5 hours. The house (and neighborhood) emits this heavily perfumed scent that can only be realized from experiencing it. 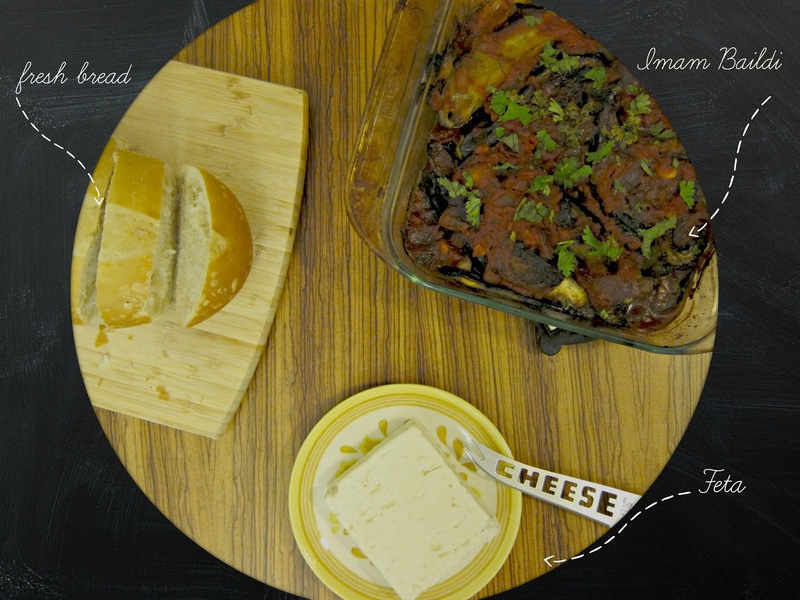 The ingredients melt together into my favorite Greek "comfort" food: Imam Baildi. Can I mention the spelling? There are two ways to spell this and it seems you can tell if it's the Turkish version or the Greek version (or made by a Greek or Turkish cook) by the spelling. Turkish is Imam Bayildi and Greek is Imam Baildi. Now, I might have just caused some serious controversy on the interwebs with that statement, but by all means, feel free to contest. All Greeks and Turks (again speaking for the people, probably getting myself into trouble) pretty much know that Imam Baildi literally means the Imam (Turkish word for priest) has fainted. He fainted because of all the olive oil used. Or he fainted because of all the garlic and onions - Aunt Mary's version. There are other stories about why he fainted, in line with the originality of each cook's Imam Baildi. The last time I made imam baildi without my Aunt Mary, it totally sucked. Watery, bland, flabby. All the words you don't want to describe good food and that purple mistress eggplant. I searched the web in lazy woman fashion for a recipe like hers but found only the fancy, labor intensive, highly photogenic, stuffed eggplant versions. This version takes less than an hour with minimal hardship and knife skills and it tastes like Aunt Mary's version. With fresh bread and feta, it may not be the prettiest out there, but it's one the best meals this working woman has had in a long time. Using about 1/4 cup olive oil, fry onions on medium high for about 5 minutes. Add garlic and lower heat. Cook for another 5 minutes. Add crushed tomatoes and continue cooking on low for another 10 minutes. Add salt, pepper flakes and a splash of wine as the sauce reduces. In the meantime, slice eggplants into lengthwise slices and then slice each down the middle. In a large, non stick frying pan, heat 1/4 cup olive oil. Once hot, begin frying the slices until brown on both sides (it should just take a few minutes on each side). Remove eggplant and repeat until batch is finished. Layer a medium sized baking vessel with eggplants, a thin layer of the tomato-onion sauce, and repeat until finished with everything. Cover with foil and bake for about 30-40 minutes. Let cool for about 15 minutes and serve with feta and fresh bread. H-oil-ly tam-oil-e! This dish looks awesome. Love the plating and the picture and labels. Thanks for a great entry. Anna, I call it bayldi and it doesn't really matter how it is written. The dish sounds delicious. I can imagine your aunt's recipe being cooked for 5 hours but it seems mine's a lazy version as well but baked in the oven. BTW still having problem to comment with chrome. I have to use firefox to leave a comment. Laura - Hahha thanks for reading the deets. Also you made a tasting looking stuffed eggplant the other day.. put me to shame girl! Themis kai Ioanna - Thank you for stopping by and appreciating the lazy imam baildi - not as pretty as a stuffed eggplant! Ivy - Looking forward to your post!